(Greatest Hits) 2006 $? ? Shadow the Hedgehog (シャドウ・ザ・ヘッジホッグ) is a video game starring Shadow the Hedgehog, an antihero of the Sonic the Hedgehog series. It was revealed at Sonic's inauguration into the Walk of Game. Shadow the Hedgehog was the first Sonic game to have an E10+ rating by the ESRB. It is also the first post-Sonic Adventure Sonic series game to not feature Sonic's name in the title. The game is the first and only in the series to feature branching level progression based on the choices of the player, allowing for up to a total of over 300 different ways to complete any given playthrough, which culminate into one of ten different endings. As in most Sonic titles, the Chaos Emeralds play a big part in this game, as Shadow must collect them in order to unlock the secrets of his forgotten past. 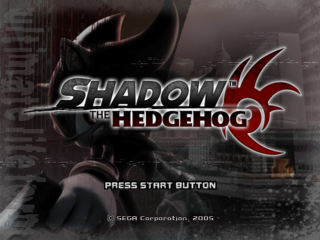 The attempt at an overall darker storyline, as well as Shadow's use of weapons and vehicles, has been criticized by fans. This has resulted in the game being considered one of the worst in the franchise. Over 50 years ago, deep in the military research facility Space Colony ARK, Professor Gerald Robotnik conducted an experiment known as "Project Shadow" while trying to unlock the secrets of the Chaos Emeralds at the request of the United Federation. The experiment culminated in "The Ultimate Life-Form"; Shadow the Hedgehog, a hedgehog with the ability to harness the mysterious power of the Chaos Emeralds in ways not thought possible. Though he was thought dead after the events of Sonic Adventure 2, Shadow has returned - with amnesia. He does not understand who he is or where he's from, but he's determined to find out, be it from Black Doom, the leader of an alien race who claims he and Shadow made a pact involving the Chaos Emeralds, or from Dr. Eggman, who seemed to be experimenting on Shadow for an unknown purpose in Sonic Heroes. He may also have to learn his secrets from the very military organization that he swore revenge against, G.U.N.. Essentially, all parties are after the Chaos Emeralds and know something of Shadow's past, and he intends to get them first and make one of them talk. GUN Fortress, Dark (Pure Dark - Dark): Shadow defeats Sonic and Diablon and moves to destroy the whole planet. GUN Fortress, Hero (Pure Dark - Hero): Shadow betrays Black Doom and defeats him at the last minute, proceeding to take over the world on his own. Black Comet, Dark (Slightly Dark - Dark): Shadow defeats Sonic and Diablon, becoming the protector and servant of Black Doom, who will enslave the world as his Dark Empire. Black Comet, Hero (Slightly Dark - Hero): Shadow defeats the Egg Dealer and declares that he and only he knows best before killing Eggman. Lava Shelter, Dark (Neutral - Dark): Shadow defeats the Egg Dealer and, believing he is an android, declares that he will be superior to the original Shadow the Hedgehog and proceeds to kill Eggman. Lava Shelter, Hero (Neutral - Hero): Shadow defeats the Egg Dealer and, believing he is an android, proceeds to take over the Eggman Empire and have androids rule, then kills Eggman. Cosmic Fall, Dark (Slightly Hero - Dark): Shadow defeats Eggman and announces his missive to protect (and presumably recreate) the ARK, sparing the doctor's life on the condition he leaves the station and never returns. Cosmic Fall, Hero (Slightly Hero - Hero): Shadow defeats Black Doom and walks away sadly, admitting that he is a research experiment gone deadly wrong. Final Haunt, Dark (Pure Hero - Dark): Shadow betrays and defeats Sonic and Diablon at the last minute, proclaiming that he is the most powerful hedgehog in the world due to the Chaos Emeralds making him invincible. Final Haunt, Hero (Pure Hero - Hero): Shadow defeats Black Doom and moves to destroy him and his army. Once all ten endings are unlocked, a true, canon final ending is unlocked. The Last Story: Shadow has obtained all seven Chaos Emeralds, but all of his comrades (Sonic and his friends, Eggman, and Black Doom) converge in the Black Comet and demand he hand them over. Black Doom reveals that Shadow's creator, Gerald Robotnik, was in development of the Ultimate Life Form, but needed an energy source. He made the decision to use Black Doom's DNA to create him, meaning that Shadow is actually Black Doom's 'son', as both share the same blood. After claiming the Chaos Emeralds and using them to teleport the Black Comet to the surface, Black Doom paralyzes and moves to surrender Shadow, Eggman, Sonic, Tails, Knuckles, Rouge and Amy to his offspring as meals; but Shadow breaks free and regains his mobility, and chases him throughout his earthbound comet. When he finds him, Team Chaotix coincidentally recovers a video recording of Gerald telling Shadow that the Black Comet would arrive 50 years after Shadow's birth, and that Shadow is the only one who can stop the malevolent Black Arms. Shadow and Black Doom transform into Super Shadow and Devil Doom respectively, and do battle. After defeating Devil Doom, Shadow uses Chaos Control to move the Black Comet into space, then activates the Eclipse Cannon to destroy it. Sonic and his friends all celebrate the saving of the world, and the game finally ends with Shadow departing the ARK's control room, saying "Goodbye forever, Shadow the Hedgehog". Shadow the Hedgehog: A rival of Sonic and the protagonist of the game. The player decides himself/herself exactly what he decides to do from the start to end of the game; his darkest ending is destroying the planet and his most heroic ending is eradicating Black Doom's army. Black Doom and Doom's Eye: The leader of the Black Arms and the game's main antagonist. He commands Shadow to bring the seven Chaos Emeralds to him and he will unlock the hidden story about Shadow's past, also witness of the creation of Shadow. Doom's Eye is an extension of Black Doom, allowing him to view what's going on when he's not there. Sonic the Hedgehog: Although he is a rival to Shadow, he can ally with him during the Westopolis, Lethal Highway, and Final Haunt levels, and races against him in the Space Gadget level. Sonic is also a boss if the player plays through the Dark Mission. Sonic is playable with controller 2 when allied with Shadow. G.U.N. Commander: The highest ranking officer of the Guardian Unit of Nations. He is one of the few who knows the secrets of Shadow's past and loathes Shadow for reasons unknown, at least until a certain level and is one of the bosses on the dark path. Dr. Eggman/Dr. Robotnik: Sonic's arch-nemesis, but this time appears as either an ally or an enemy, depending on the player's choices. He plans to create a utopia called Eggmanland, but needs to get rid of G.U.N., the Black Arms, Sonic and company to do so. He tracks Shadow and follows him through means of a floating camera-monitor. Professor Gerald Robotnik: A brilliant scientist as well as Shadow's creator and grandfather of Maria and Dr. Eggman, and the top researcher on board Space Colony ARK. Maria Robotnik: Prof. Gerald Robotnik's Granddaughter; she was Shadow's best friend who gave her life to save him from G.U.N. These characters are playable with controller 2 in the GameCube and PlayStation 2 versions. Sonic the Hedgehog: During Westopolis, Lethal Highway, and Final Haunt, he will be your ally. and you also can do races against him in the Space Gadget level, or face him in the dark endings of GUN Fortress, Black Comet, and Final Haunt, but not as the main boss. Rouge the Bat: She appears in the Digital Circuit, GUN Fortress, and Death Ruins levels as an ally. E-123 Omega: Omega appears in the Iron Jungle and Lava Shelter levels as an ally. Omega is the only ally that does not appear in the opening and the last story. Vector the Crocodile: He appears in the Cosmic Fall level as an ally. Espio the Chameleon: He appears in the Mad Matrix level as an ally. Charmy Bee: Like Doom's Eye and Dr. Eggman; however, he hovers just out of reach and does not fight. He is not playable using controller 2. He appears in the Prison Island level as an ally. Miles "Tails" Prower: He appears in the Circus Park and Air Fleet levels as an ally. Knuckles the Echidna: He appears in the Glyphic Canyon, Central City, and Black Comet levels as an ally. Amy Rose: She appears in the Cryptic Castle level as an ally. Eggman's Drone: Appears in the Sky Troops, Iron Jungle, Lava Shelter, Circus Park, and the Cryptic Castle levels as an ally. Eggman's robots count as hero enemies if there are any Black Arms on the level, even if he's the dark mission, leading to a hard situation on Cryptic Castle, where both the hero AND dark mission characters complain about killing one type of enemy! Maria Robotnik: She appears in Shadow's memories in the Doom and Lost Impact levels as an ally. Cream the Rabbit: She is part of the hero mission of Cryptic Castle where Amy needs Shadow to help rescue Cream, as well as her Chao, Cheese. She never tags along with Shadow as an ally. Doom's Eye: Doom's Eye is Black Doom's third eye and a "character" in the story who mainly just watches Shadow. Black Doom is also one of the bosses. He appears in the Westopolis, Glyphic Canyon, Prison Island, Sky Troops, Lethal Highway, Death Ruins, Final Haunt, Space Gadget, Cosmic Fall, Digital Circuit, Mad Matrix, The Doom, Central City, Air Fleet, Black Comet, The Ark, and GUN Fortress levels as an ally. Shadow must get from the start of the level to the end, as has traditionally been the case for the Sonic titles. It is possible to reach the end of the level in more than one way; the traditional way is to reach a goal ring, but certain objectives can be completed to end the level as well. Three missions are available in each level (denoted Hero, Dark, and Neutral), though some only have two; the player has free reign over which mission they choose to complete. The way in which levels are completed affects how the game progresses, what levels are played, and, ultimately, which of the 10 possible endings will be earned. There are a total of 23 levels (including the Last Story's stage), but the player will only play six in one sitting. As each level features distinct cutscenes and boss battles, there are a total of 326 different paths to take through the game, and each one has a unique name. A list of possible paths can be found here: List of Library sequences. Shadow can still use all his moves from the previous games like the Jump Dash, Homing Attack and Spin Dash; he also has a three-hit physical combo and an aerial spin kick when he isn't carrying a weapon. In addition, Shadow now has two Chaos abilities, Chaos Control (which warps him forward through levels, or massively slows time during boss battles) and Chaos Blast (which creates an explosion of pure energy, decimating anything near him). These two powers are tied to blue and red gauges on the screen which are filled similarly to the Team Blast gauge in Sonic Heroes: killing aliens or destroying their twisted architecture powers the blue gauge, while attacking humans and nature fuels the red gauge. When a gauge is filled, until it depletes, Shadow is granted unlimited ammunition, full invincibility, and the use of the corresponding power at the cost of draining the meter more quickly. The biggest addition to Shadow's arsenal, however, would be his ability to use a variety of weapons. There are 5 classes of weapons in the game: melee, gun, lock-on, cannon, and vacuum. Melee weapons are used for close combat, and only consume "ammo" when they strike something. guns are long-range weapons that can be found in semi- or fully-automatic variants, and Shadow will automatically aim them at targets to an extent. Lock-on weapons usually take the form of missile launchers which can target several foes at once through holding down the button. Cannons can only be aimed directly forward, but deal massive damage and have a blast radius. Vacuum weapons are unique in that they can 'inhale' smaller enemies and fire them at other enemies; they can also pull platforms out of the walls in Final Haunt. The use of weapons is fully optional, save for specific levels or missions that require their use. Besides wielding weapons, Shadow can commandeer vehicles: cars, motorcycles, G.U.N. mechs, alien crafts, etc. are found in several levels. Shadow is, of course, incredibly fast on his own merit, so the use of vehicles is largely unnecessary and even detrimental, as he can outrun them all, even the prominently-advertised motorcycle. That said, the vehicles do have limited application, such as jumping off the motorcycle to turn it into a rolling missile. Vehicles are also capable of performing on acid-soaked floors. Otherwise, vehicles are optional. The enemies change depending on which side the player chooses, though all non-partner characters will indiscriminately attack Shadow regardless of the chosen mission. If Shadow chooses to commit acts of heroism, then the Black Arms will be the main enemies. If Shadow chooses to commit acts of evil, then the GUN Troops will be the enemy. If Shadow decides to be neutral, then everyone is an enemy. Whether Eggman's robots are a Hero enemy or a Dark enemy depends on whether the opposite group of enemies are the Black Arms or GUN. Shadow is free to attack any free-roaming enemy/ally present (exempting Shadow's 'partner character'), regardless of which faction Shadow chooses to ally himself with. Attacking an ally provokes a scold from Shadow's partner and a score penalty at the end of the level. The gaming community had strong opinions on the preview 'Shadow' videos posted on popular Internet gaming sites (such as GameSpot or IGN.com). Many comments were made about the gun Shadow wielded. Some argue that it goes entirely against the spirit and/or gameplay mechanic of the Sonic series or that Shadow should be powerful enough that a gun would not be necessary, given that he has proclaimed himself to be the "Ultimate Life Form" in Sonic Adventure 2. Others note his technological background in defense of the weapon, from his inception to the air shoes he wears and the weapons that Eggman and Tails used in Sonic Adventure 2. Another topic of discussion is Shadow getting a game over Sonic; after Sonic Heroes, many fans had been hoping for a new Sonic game that would take the direction that game was heading and lead it toward a more retro feel, closer to that of the original Sega Mega Drive games. When it was revealed that that was not the direction the new title was heading, some people were disappointed. A rebuttal to some of the criticisms was that it was a sidestory game, and not starring Sonic himself; therefore, as it couldn't be considered a true Sonic game (much like Knuckles' Chaotix), it should be given some freedom to attempt new things without hampering the main series. Another rebuttal was that it was an early preview, and that it could have ended up significantly changed by the game's ultimate release. An album has been released entitled Lost and Found: Shadow the Hedgehog Vocal Trax. Several music tracks from the game are featured in this album, while some mixes were made to others. There is also a promotional song in Japan : a remix of m-flo's "TRIPOD BABY" track off of BEAT SPACE NINE, their latest album. "I Am... All of Me" by Crush 40 (Trailer, Main Theme, Intro and Final Boss theme) A lyric in this refers to "What I'm Made Of", the theme of the final battle in Sonic Heroes (Unleashed a million faces, And one by one they fall). Since it was the game in which Shadow was introduced, many of the songs featured in Sonic Adventure 2 were remixed for Shadow the Hedgehog. An extended version of that remix used before battles with the Egg Dealer. The song's true title, "E.G.G.M.A.N. Doc Robeatnix Mix" wasn't revealed until the "Shadow the Hedgehog : Lost and Found" album was released. There is also an Event song not listed in the Sound Test (called "Strategy" in the Shadow the Hedgehog Original Sound Trax) that is a remix of an Event song in Sonic Adventure 2. During the Last Story cutscene in which Shadow uses the Chaos emeralds to go Super, a slower, remixed music clip of "I Am (All of Me)" plays, then seamlessly switches to a remixed music clip of "Live and Learn", the main theme of Sonic Adventure 2. This is one of the first Sonic games in which the North American voice actors from the the cast of Sonic X voiced the videogame characters in the English language dub. Many Sonic fans were angered by the change and sent demands to Sega to rehire the original voice cast. The Japanese cast was unaffected by this decision, since the Japanese version of Sonic X already used the same voice actors as the game series did since the first Sonic Adventure game. The PlayStation 2 and Xbox versions have both voice language tracks included in the game disc. The PlayStation 2 version, together with a multi-lingual text language option, is the only version featuring an additional option to switch between both English and Japanese voice language, though this is only present in the Japanese and North American versions. The EU/PAL PlayStation 2 version remove this feature and only has the text language option present, defaulting the voices automatically to the system language. Since the Xbox version doesn't feature any language option at all, neither of text nor of voice, the only way to have the Japanese voices in this version is changing the console language to Japanese in order to set the game entirely in Japanese. The GameCube version features only one voice track in the disc and according to the regional version, due to size constraints. The Western versions have the English voice language whereas the Japanese version has the Japanese one, while the text language is entirely multi-lingual and manually selectionable in all regional versions. This game features two bosses that have the same names as two F-Zero machines from the game F-Zero. One is the Blue Falcon owned by GUN and the other is Black Bull owned by the Black Arms. Even more coincidental is that the two F-Zero machines are owned by the main protagonist and antagonist of the game, Captain Falcon and Black Shadow, respectively. GUN and the Black Arms are the two opposing sides in Shadow the Hedgehog. Whether this was intended or not is unknown. However, it could be related to Sega co-developing F-Zero GX a few years prior. On another note, the victory pose that Omega does is strikingly similar to a pose made by another F-Zero character, Michael Chain. To promote the game, third-party game accessory developer NubyTech made a special Shadow the Hedgehog-themed controller designed exclusively for the PlayStation 2 console. This page was last edited on 8 March 2019, at 22:07.